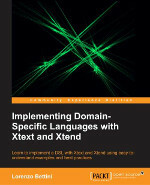 Research group: "Semantics and Logics of Computation"
Implementing Domain-Specific Languages with Xtext and Xtend. Master Degree (with Honors) in Computer Science (Università di Firenze), April 1998. Ph.D. in Computer Science (Università di Siena), February 2003. Postdoc at Dip. Sistemi e Informatica Università di Firenze, February 2003-September 2007. Assistant Professor (Università di Torino) since October 2007. Theory and Implementation of Object-Oriented and Mobile Code languages. Design and Implementation of Distributed Applications with Mobile Code. Most of the papers available at this link appear in print, and the corresponding copyright is held by the publisher.